(Reuters)Pope Francis talks to journalist on the papal plane during his flight to Manila. Pope Francis has said that "the world is at war" as he spoke about the slaying of a Catholic priest by radical Islamists in France, but he asserts it is not a war of religion. He said the slaying July 26 of the Rev. Jacques Hamel, 86, in St.-Etienne-du-Rouvray, France, was a casualty in this conflict, CNN reports. The kilof the priest - by two attackers who struck in the name of the group calling itself ISIS, IS or Daesh - is the latest terror atrocity to roil Europe in recent weeks. "The world is at war because it has lost peace," he said. "There is a war of interest, there is a war for money, a war for natural resources, a war to dominate people," he continued. "Some might think it is war of religion. It is not. All religions want peace. Others want war." On July 27, ISIS' media wing, Amaq, posted a video on the Telegram messaging app that showed the two attackers pledging allegiance to the terror group. 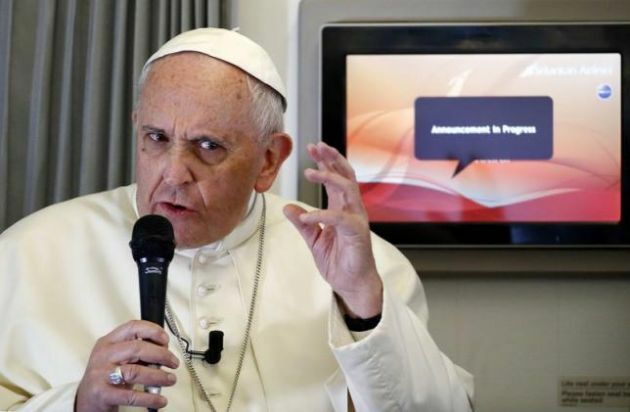 Speaking on the papal plane on his way to Krakow, Poland, for World Youth Day celebrations, Francis said the world had been in "a piecemeal war" for some time. French President Francois Hollande said the attackers acted in the name of ISIS, and Amaq released a statement, posted by the group's supporters, claiming the Normandy attackers were the terror outfit's "soldiers." These "soldiers" arrived during morning mass in Saint-Etienne-du-Rouvray, a working-class town near Rouen, northwest of Paris, where the 86-year-old parish priest was leading prayers. "They forced him to his knees and he tried to defend himself and that's when the drama began," Sister Danielle, who escaped as the attackers slayed the priest, told RMC radio. "They filmed themselves. It was like a sermon in Arabic around the altar," the nun said, Reuters news agency reported. CNN said it has not independently confirmed the ISIS claim, and no evidence has surfaced showing that ISIS had a planning role in the attacks. The terrorists held three other worshippers hostage until the assailants were killed, one of them was badly wounded during the attack. As the attackers came out of the church shouting "Allahu akbar" ("God is Greatest") they were shot and killed by police. The attack came less than two weeks after the Bastille Day terror attack that left 84 people dead in Nice, France. The slaughter has fueled public anger and highlighted apparent shortcomings in the French government's ability to respond to the domestic jihadist threat, carried out by people claiming to represent Islam.